Are you tired of never-ending cycle of making and printing weekly newsletters? First you edit it in Word, PowerPoint, or whatever. You print it out. You make the copies with a sandwich stuck in your mouth during your precious few minutes of lunch break. Then you either stuff them in folders yourself or waste valuable instructional time handing them out to students to insert themselves. Until you go home and unwittingly check your email. Only to find out Alex’s mom has a ton of questions about test dates, the next field trip, what’s for homework this week, etc. – ALL of those things you had descriptively written in your newsletter. You go ahead and answer the email nicely with all of the same information that’s in your newsletter. Just as you press send, you receive another email. This one is from Patrice’s mom. With the same. exact. questions. You feel like you might go crazy. But hey, you’ve already written this down in the previous email. So you go to your Sent inbox, copy what you wrote to Alex’s mom, then paste and edit it in a new email to Patrice’s mom. You sign out of your email before another parent email has a chance to sneak in your inbox. The next morning, you walk into your classroom and spy on the floor by Alex’s desk none other than………the newsletter. Makes sense. You go to Patrice’s desk but there is no newsletter to be found. Students come in one by one. You greet them with a hug. When Patrice comes in you ask if you can check her folder really quick. There’s no newsletter. You then walk over to her open book bag. There at the bottom of a lunch box, a HatchiBaby and 17 legos, you find squashed and wadded up – the weekly newsletter. Let’s stop this vicious cycle before you really do go crazy! 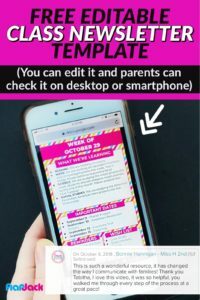 Switching to an editable Google slides weekly newsletter (and class website – see further down) was the best change I ever made in enhancing parent communication and reducing email response time. It was so life-changing for parent communication, that I rarely had to answer an email that wasn’t specifically about a student issue and how to help him/her. Emails about general class info almost completely disappeared. Then download the Supporting Document over at my TpT store here. The checklist included will help you remember the main steps below for editing and sharing your newsletter template. In the supporting document, you’ll find a button for the editable newsletter template. Click on it and make a copy (it will automatically be saved into whichever Google account you’re signed into). Change the name of the file to something easy to find in your Drive account. Edit the text of the newsletter however you wish for your classroom weekly informational needs. Now you’re ready to create a “presentation” view of your editable newsletter and share with your parents. To do so, first change the Share settings of your doc by going to Share > Advanced > Change > Anyone with the link can view. Then click on the arrow right besides the Present button. A Presentation view of your doc will appear which will look much nicer for your parents on their phones and desktop. But first you need to tweak the URL. Go to the end of it where it says “edit” and replace it with preview or presentation. Either word will do the job and allow your parents to view the doc from anywhere. Making a share link that is easy to share and remember is crucial for making your editable class newsletter as successful as it can be. First copy the long URL you created in the last step to your clipboard by right-clicking on it. Go to https://tinyurl.com/ and paste the URL in the correct box. In that same box you can make a custom alias or user-friendly, easy-to-remember link. Once you click the Make TinyUrl! button, you’ll find your special custom link on the next page. Copy it and share, share, share! Email it, make stickers with it, and definitely make a big deal about it at Open House. If all goes well, you’ll be amazed at how much time you save in answering parents’ questions about what’s going in your classroom. I love the Remind app for sharing my digital newsletter once I’ve updated it. Tuesdays were newsletter days, so during my morning break, I would update the newsletter (I also shared it with my partner teacher. We could both update the newsletter at the same time which was soooo convenient.). Once we both finished, I used the Remind communication app to schedule a message to my parents to let them know the newsletter was updated for the new week. I always tried scheduling it at the end of the school day, right when I predicted that students were at home with their parents, ready to look over homework and study for future tests. 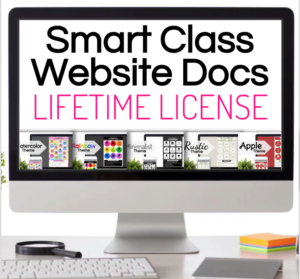 This idea was so helpful for us, that I create a complete “Smart” Class Website Doc for us. 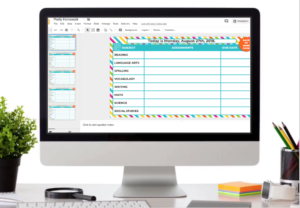 Here my partner teacher and I could easily edit and update the same doc on a variety of information topics – websites, homework, school policies, classroom policies, subject study tools, our contact information, about the teacher, student of the week and more. 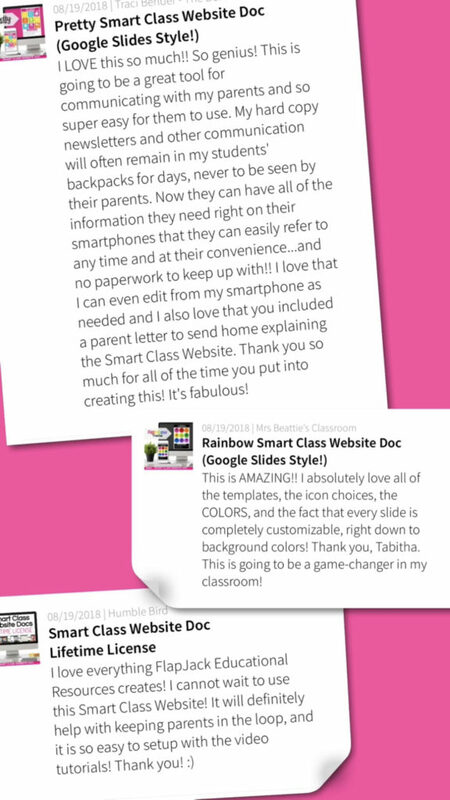 The amazing thing about the Smart Class Website doc is that you can edit it on any desktop or even your smartphone with the Google Slides app. When you add a change to one device, it will update everywhere right in the moment. This means if you need to rush out at the end of the day for a doctor’s appointment or whatever reason, you can update the newsletter and other items while sitting in the waiting room or on your laptop at home. 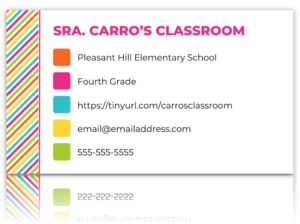 I also created business card templates so you can easily insert and share your Smart Class Website with parents and students. 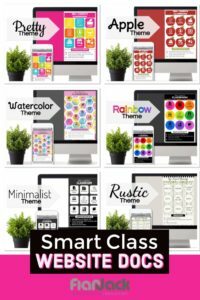 At the time of writing this blog post, I have nine Smart Class Website themes available and also a Smart Class Website License if you want access to all themes to use and change up year after year. A lot of teachers have already tried it out and are happy with its benefits with ease in parent communication. If you try out the newsletter freebie and you’re interested in a full Smart Class Website, you can check out all the themes here. Let me know what you think!